Oscar Lopez Rivera (right) and his brother Jose speak about Oscar’s release from prison at La Casita de Don Pedro, 2625 W. Division St. Some consider Puerto Rican nationalist, Oscar Lopez Rivera, a patriot and others a terrorist. Conflicting views of the city’s recognition of the 74-year-old Puerto Rico native caused several clashes between Rivera supporters and protestors during his May 18 welcome home event. Rivera returned to the community he helped found numerous community organizations in after serving 35 years of his 75 year sentence after being charged with “seditious conspiracy,” for being a militant anti-colonial fighter with a paramilitary group called Fuerzas Armadas de Liberación Nacional Puertorriqueña (FALN). Michael Reyes, Rivera supporter and spoken word artist speaks about Rivera’s accomplishments in the Humboldt Park community. Photo by Connor Carynski. The FALN group claimed responsibility for over 120 bombings in Chicago, New York, and Washington, D.C., between 1974 and 1983, according to the Chicago Historical Society. FALN organized the bombings to protest U.S. military presence in Puerto Rico and draw attention to Puerto Rico’s political relationship with the United States. Although Rivera was imprisoned and dubbed a terrorist by many, he is still esteemed in Puerto Rican communities like Humboldt Park because of the roles he played in establishing numerous community organizations such as Paseo Boricua, the Puerto Rican Cultural Center, Hispanic Housing’s Teresa Roldan Apartments, Roberto Clemente Community Academy, as well as the Dr. Pedro Albizu Campos Puerto Rican High School. Starting at La Casita de Don Pedro, 2625 W. Division St. and finishing in the Humboldt Park boathouse, Rivera’s homecoming was recognized throughout the procession by U.S. Representative Luis Gutierrez (D-Ill.), Alderman Roberto Maldonado (26th), Ald. Carlos Ramirez-Rosa (35th), Ald. Joe Moreno (1st) as well as community leaders such as Billy Ocasio from the National Puerto Rican Museum of Art. A street sign was also dedicated in Lopez’s name during the welcome home event. 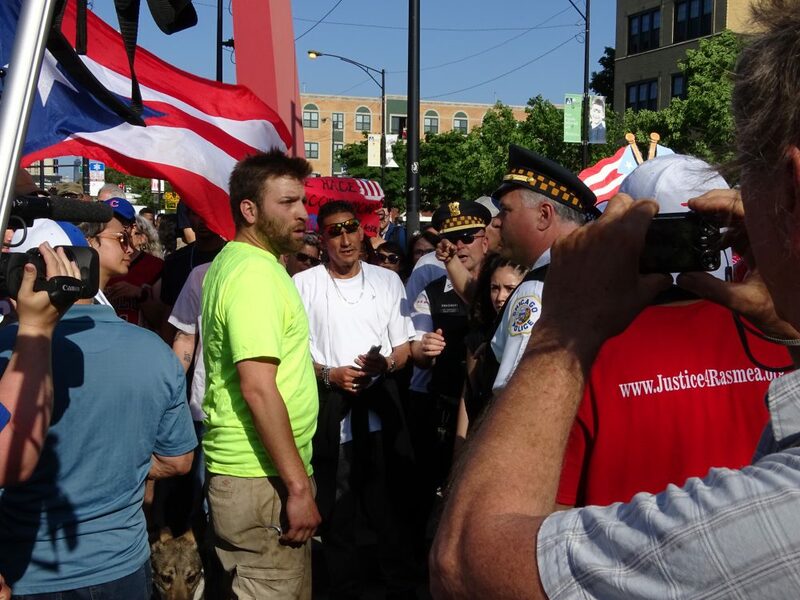 Humboldt Park resident, Mark Heller protests Chicago’s honoring of Rivera because of Rivera’s connection to the paramilitary group, Fuerzas Armadas de Liberación Nacional Puertorriqueña. Photo by Connor Carynski. 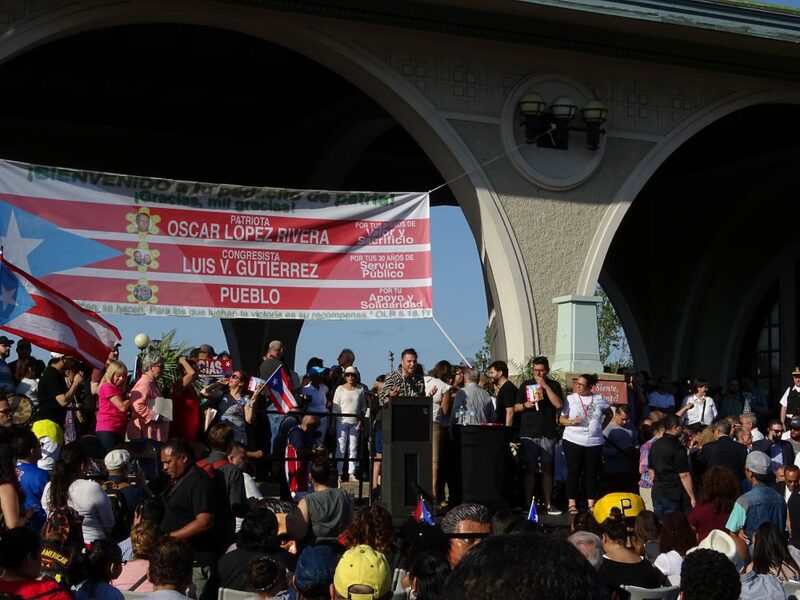 A float, musicians, dozens of Puerto Rican flags and hundreds of people marched alongside Rivera but while the majority of parade attendees supported Lopez’s being honored, others took a different stance on his recognition from the city. Humboldt Park resident and retired molecular biologist, Mark Heller, protested Lopez’s recognition and said although he has done a number great things for the community and served in the Vietnam War, he is undeserving of praise because of his ties to a group that is responsible for the deaths of numerous innocent lives. Heller said he had no personal tie to Rivera but felt it was his duty as a community member to protest the event. Throughout the parade Heller carried a sign stating Rivera is a terrorist, which was repeatedly covered by Puerto Rican flags carried by Rivera supporters. Heller said throughout the event supporters repeatedly tried to tear down his sign and knocked off his hat. Heller added he felt he was disrespected at the event because he peacefully protested but was met with hostile attitudes from supporters. 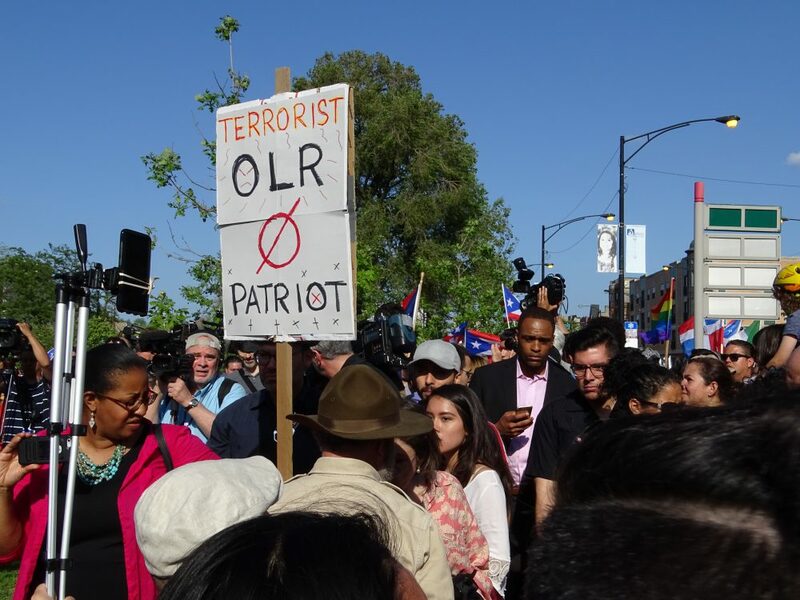 Heller said he thought many members of the Humboldt Park community viewed Rivera as a hero because they are unaware of his involvement in the FALN organization. A vocal protester confronts police before being escorted away from the scene. Photo by Connor Carynski. Two other protestors were involved in brief scuffles during the event and were escorted away from the rest of the parade by police officers. Michael Reyes, a spoken word artist who spoke on behalf of Rivera at the event said he supported Rivera because of the numerous contributions he made to the Humboldt Park community in the late-seventies. Reyes said Rivera’s contributions both provided Humboldt Park with basic community needs that it lacked and created a movement for civil rights that continues to this day. Rivera will continue to make appearances throughout the country and will again be honored as grand marshal of the 39th annual Puerto Rican parade planned for June 17.